The brow ridge, or supraorbital ridge known as superciliary arch in medicine, refers to a bony ridge located above the eye sockets of all primates. In Homo sapiens sapiens (modern humans) the eyebrows are located on their lower margin. Frontal bone. Outer surface. Brow ridge labelled as "superciliary arch" at center right). The brow ridges are often not well expressed in human females, as pictured above in a female skull, and are most easily seen in profile. The brow ridge is a nodule or crest of bone situated on the frontal bone of the skull. It forms the separation between the forehead portion itself (the squama frontalis) and the roof of the eye sockets (the pars orbitalis). Normally, in humans, the ridges arch over each eye, offering mechanical protection. 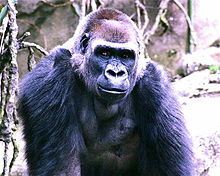 In other primates, the ridge is usually continuous and often straight rather than arched. The ridges are separated from the frontal eminences by a shallow groove. The ridges are most prominent medially, and are joined to one another by a smooth elevation named the glabella. Typically, the arches are more prominent in men than in women, and vary between different ethnic groups. Behind the ridges, deeper in the bone, are the frontal sinuses. The brow ridges, being a prominent part of the face in some ethnic groups and a trait linked to both atavism and sexual dimorphism, have a number of names in different disciplines. In vernacular English, the terms eyebrow bone or eyebrow ridge are common. The more technical terms frontal or supraorbital arch, ridge or torus (or tori to refer to the plural, as the ridge is usually seen as a pair) are often found in anthropological or archaeological studies. In medicine, the term arcus superciliaris (Latin) or the English translation superciliary arch. This feature is different from the supraorbital margin and the margin of the orbit. 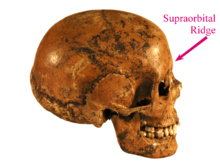 Some paleoanthropologists distinguish between frontal torus and supraorbital ridge. In anatomy, a torus is a projecting shelf of bone that unlike a ridge is rectilinear, unbroken and goes through glabella. Some fossil hominins, in this use of the word, have the frontal torus, but almost all modern humans only have the ridge. The Spatial model proposes that supraorbital torus development can be best explained in terms of the disparity between the anterior position of the orbital component relative the neurocranium. Much of the groundwork for the spatial model was laid down by Schultz (1940). He was the first to document that at later stages of development (after age 4) the growth of the orbit would outpace that of the eye. Consequently, he proposed that facial size is the most influential factor in orbital development, with orbital growth being only secondarily affected by size and ocular position. 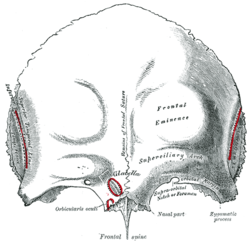 Weindenreich (1941) and Biegert (1957, 1963) argued that the supraorbital region can best be understood as a product of the orientation of its two components, the face and the neurocranium. The most composed articulation of the spatial model was presented by Moss and Young (1960), who stated that "the presence… of supraorbital ridges is only the reflection of the spatial relationship between two functionally unrelated cephalic components, the orbit and the brain" (Moss and Young, 1960, p282). They proposed (as first articulated by Biegert in 1957) that during infancy the neurocranium extensively overlaps the orbit, a condition that prohibits brow ridge development. As the splanchocranium grows, however, the orbits begin to advance, thus causing the anterior displacement of the face relative to the brain. Brow ridges then form as a result of this separation. The bio-mechanical model predicts that morphological variation in torus size is the direct product of differential tension caused by mastication, as indicated by an increase in load/lever ratio and broad craniofacial angle. Research done on this model has largely been based on earlier work of Endo. By applying pressure similar to the type associated with chewing, he carried out an analysis of the structural function of the supraorbital region on dry human and gorilla skulls. His findings indicated that the face acts as a pillar that carries and disperses tension caused by the forces produced during mastication. Russell and Oyen et al. elaborated on this idea, suggesting that amplified facial projection necessitates the application of enhanced force to the anterior dentition in order to generate the same bite power that individuals with a dorsal deflection of the facial skull exert. In more prognathic individuals, this increased pressure triggers bone deposition to reinforce the brow ridges, until equilibrium is reached. Oyen et al. conducted a cross-section study of Papio anubis in order to ascertain the relationship between palate length, incisor load and Masseter lever efficiency, relative to torus enlargement. Indications found of osteoblastic deposition in the glabella were used as evidence for supraorbital enlargement. Oyen et al.’s data suggested that more prognathic individuals experienced a decrease in load/lever efficiency. This transmits tension via the frontal process of the maxilla to the supraorbital region, resulting in a contemporary reinforcement of this structure. This was also correlated to periods of tooth eruption. In a later series of papers, Russell developed aspects of this mode further. Employing an adult Australian sample, she tested the association between brow ridge formation and anterior dental loading, via the craniofacial angle (prosthion-nasion-metopion), maxilla breadth, and discontinuities in food preparation such as those observed between different age groups. Finding strong support for the first two criteria, she concluded that the supraorbital complex is formed as a result of increased tension due to the widening of the maxilla, thought to be positively correlated with the size of the masseter muscle, as well as with the improper orientation of bone in the superior orbital region. The brow ridge functions to reinforce the weaker bones of the face in much the same way that the chin of modern humans reinforces their comparatively thin mandibles. This was necessary in pongids and early hominids because of the tremendous strain put on the cranium by their powerful chewing apparatuses, which is best demonstrated by any of the members of the genus Paranthropus. The brow ridge was one of the last traits to be lost in the path to anatomically modern humans, and only disappeared in a majority of modern humans with the development of the modern pronounced frontal lobe. This is one of the most salient differences between Homo sapiens and other species like the Homo neanderthalensis. Image of a rugby player with a pronounced supraorbital ridge. The size of these ridges varies also between different species of primates, either living or fossil. The closest living relatives of humans, the great apes, have a relatively pronounced supraorbital ridge, which has also been called a frontal torus while in modern humans it is relatively reduced. The fossil record indicates that the supraorbital ridge in early hominins was reduced as the cranial vault grew; the frontal portion of the brain became positioned above rather than behind the eyes, giving a more vertical forehead. 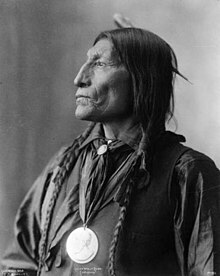 Native American man with pronounced brow ridge and sloping forehead. Pronounced brow ridges was a common feature among paleolithic humans. Early modern people like the finds from Jebel Irhoud and Skhul and Qafzeh had thick, large brow ridges, and also some living people, have quite pronounced brow ridges, but they differ from those of archaic humans like Neanderthals by having a supraorbital foramen or notch, forming a groove through the ridge above each eye, although there were exceptions, such as Skhul 2 who had unbroken frontal torus, unlike other members of her tribe. This splits the ridge into central parts and distal parts. In current humans, almost always only the central sections of the ridge are preserved (if preserved at all). This contrasts with many archaic and early modern modern humans, where the brow ridge is pronounced and unbroken (sometimes called frontal torus). Although, there are rare cases of an unbroken frontal torus among modern humans. Especially among Pintubi ethnic group of Australian Aborigines, such as Lex Wotton. Prominent supraorbital ridges among modern humans are most common among Australian Aborigines, Papuans, and some South Asians. ^ For some basic English definitions refer to the American Heritage Dictionary online under supraorbital Archived 2007-12-14 at the Wayback Machine and torus Archived 2007-12-15 at the Wayback Machine. Webster's Third New International Dictionary also does not make the distinction. ^ a b Sollas, W.J. "The Taungs Skull". Nature. 115: 908–9. Bibcode:1925Natur.115..908S. doi:10.1038/115908a0. ^ Endo, B (1965). "Distribution of stress and strain produced in the human face by masticatory forces". Journal of the Anthropological Society of Nippon. 73: 123–136. doi:10.1537/ase1911.73.123. ^ Endo, B (1970). "Analysis of the stress around the orbit due to masseter and temporalis muscles". Journal of the Anthropological Society of Nippon. 78: 251–266. doi:10.1537/ase1911.78.251. ^ Endo, B (1973). "Stress analysis of the gorilla face". Primates. 14: 37–45. doi:10.1007/bf01730514. ^ Endo B (July 1966). "A biomechanical study of the human facial skeleton by means of strain-sensitive lacquer". Okajimas Folia Anatomica Japonica. 42 (4): 205–17. doi:10.2535/ofaj1936.42.4_205. PMID 6013426. ^ a b Russell, MD (1985). "The supraorbital torus: "A most remarkable peculiarity."". Current Anthropology. 26: 337. doi:10.1086/203279. ^ Russell MD (May 1982). "Tooth eruption and browridge formation". Am J Phys Anthropol. 58 (1): 59–65. doi:10.1002/ajpa.1330580107. ^ Oyen OJ, Walker AC, Rice RW (September 1979). "Craniofacial growth in olive baboons (Papio cynocephalus anubis): browridge formation". Growth. 43 (3): 174–87. PMID 116911. ^ "On skull form and the supraorbital torus in primates". Current Anthropology. 27 (3): 257. July 1986. doi:10.1086/203427. JSTOR 2742880. ^ "Homo sapiens - H. sapiens (Anatomically Modern Humans - AMH) are the species we belong to". ^ Bhupendra, P. "Forehead Anatomy". Medscape references. Medscape. Retrieved 11 December 2013. Endo, B (1965). "Distribution of stress and strain produced in the human face by masticatory forces". Journal of the Anthropological Society of Nippon. 73 (4): 123–36. doi:10.1537/ase1911.73.123. Endo, B (1970). "Analysis of stresses around the orbit due to masseter and temporalis muscles respectively". Journal of the Anthropological Society of Nippon. 78 (4): 251–66. doi:10.1537/ase1911.78.251. Endo, B (1973). "Stress analysis of the gorilla face". Primates. 14: 37–45. doi:10.1007/bf01730514. Russell, Mary Doria (June 1985). "The Supraorbital Torus: 'A Most Remarkable Peculiarity'". Current Anthropology. 26 (3): 337–360. doi:10.1086/203279. Oyen, Ordean J.; Rice, Robert W.; Cannon, M. Samuel (July 1970). "Browridge structure and function in extant primates and Neanderthals". American Journal of Physical Anthropology. 51 (1): 83–95. doi:10.1002/ajpa.1330510111. Wikimedia Commons has media related to Superciliary arch. The Frontal Bone, California State University at Chico site.